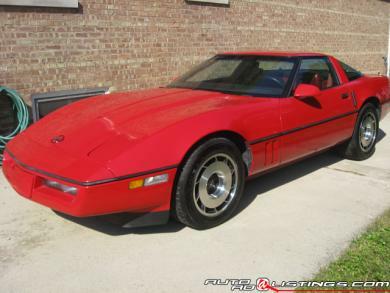 For sale is a 1985 corvette, The mileage is correct 4,789. There are two items that are not original , the battery and the rear glass. The rear glass was smashed in an attempt to steal the targa top. This took place where I had the vehicle stored, the vehicle has minor scrathes and dings, again from the storage facility.Nothing a detail shop couldnt handle.The inside of the targa top is also peeling.The original tires are still on the vehicle.This vehicle has several options one of them being the z51 code. For futher info on the codes please call or email me.I have no problem showing the car,I would rather so there's no hidden questions.The price is negotionable. I had the vehicle tuned up,I kept the original wires, plugs etc.Like I said THE MILEAGE IS CORRECT.If you have any questions please contact me, I will answer them to the best of my knowledge.Yes the car sat for a very long time. I drove it home and once again parked it.I will not drive the car to show it, but you are welcome to come see it. Please serious Buyers only.